I’ll be the first to admit that I didn’t "get" Twitter. When I first heard about it and saw that "tweets" were 140 character micro-blog posts that contained such mindless drivel as "Heading out to work" or "Getting a haircut" I dismissed it as pointless. A couple of months ago my good friend Jeff told me that I should give Twitter a go. Jeff’s a bright guy so I ask him "Why on earth would I want to do that?". His response was "You don’t blog frequently enough for me". Well, this was indeed true. As I’ve been working more and more on my startup I didn’t have as much time to devote to blogging. I had lots of things I wanted to share but didn’t want to take the time to put together a full blog post for it. So in July of ’08 I grabbed a Twitter account and started tweeting away. I only had a couple of "followers" (people that would see my tweets in their Twitter home page) for the first few weeks. They were close friends that were also playing with Twitter for the first time. At that point simply using the interface that Twitter provides on their home page was enough. I’d drop in my 140 character status, catch up with what my friends were doing and that was that. After a couple of months I had done little more than checked in a couple times a day to see what people had "said" and try to drop in a pithy quote here or there. Then Jeff pointed me towards the Search feature in Twitter and mentioned the value in using key tags in a search. Since Jeff and I are both huge Washington Redskins fans he found that many people were inserting a #skins tag in their tweets. By searching for that we could see a global and very dynamic conversation that was going on with our favorite football team. As new tweets came in for the search term a dynamic indicator at the top of the search page would indicate how many new results there were and provide a link to refresh the page. This was great and opened a whole new way for me to look at Twitter. It suddenly became more about participating in a global conversation on topics of interest, a cross between an old fashioned chat room and a forum. While all this was great there was one little problem. I found myself constantly pulling up browser tabs with different searches on them that would allow me to see what was going on. Though the web interface for Twitter is very easy I found that the more I used it the more difficult it became to manage the various views I had for Twitter data. Within any of these columns you can also set a filter to help limit what you actually see in the event your are tapping a tweet source that is very active. You can also mark tweets as read and have them removed from your view if you only want to see what’s new. At the top of the All Tweets column is a number that shows you how many unread tweets you have though that’s the only place the unread count appears for me on the current 0.20b version. Individual tweets display the image for the person making the tweet that doubles as a menu for interacting with it. Mouse over it and you have the ability to Reply, Retweet, Send a Direct Message or mark the tweet as a favorite. The area at the top of the window for entering tweets is spacious and clearly marks how many characters you have typed in, also giving you tools to insert a shortened URL or a TwitPic (always helpful when dealing with a 140 character limit). This was also something I turned off. 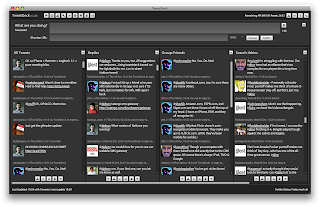 Iain Dodsworth, the developer of TweetDeck indicated in a recent tweet that it would soon offer Growl support. TweetDeck works by talking to the Twitter APIs, pulling down the messages you are reading and dropping them into a database on your local machine. Though you can manually pull down tweets at any time Twitter limits you to the number of API calls you can make in a specified period of time. You have some control over this polling of the Twitter service if you feel like tweaking how quickly your tweets come in. I really enjoy using TweetDeck. Though I would like the user interface to be a lot more compact I can generally see most of what I want on a single screen if I make the window large enough. On my Mac Pro with two 1600×1200 displays I’ve found that TweetDeck works best with 4 visible columns. Unfortunately you cannot size the columns so on my 1600 pixel wide display I max out at 5 visible columns. I love that it has shortcuts for URLs and pictures when I am creating a tweet and that I can Retweet something I find interesting to my group of followers. I really do wish the text entry area had auto spell checking though; since it’s now embedded in virtually every editing surface I have I’ve become quite accustomed to seeing little red squiggles when a word is misspelled. Getting beyond the UI, the biggest benefit to TweetDeck is that I can create a number of different columns that can track my interests, especially by entering a search term. This is where Twitter stops becoming just a cute little time waster and starts to become a very powerful networking tool. If you have a deep interesting in something just put it in a search column in TweetDeck and see what comes up. If it’s an active topic the search window will dynamically update, providing you with an ongoing stream you can dive in to if you see something that catches your fancy. I have had some problems with these dynamic search windows in TweetDeck on occasion. Some times they will simply stop grabbing new results and need to be closed and reopened in order to see new results. TweetDeck is not perfect but it is by far the best tool I’ve used for accessing Twitter. If you’ve got a better tool for accessing Twitter please drop a note in the comments or feel free to follow me on Twitter and shoot me a reply.